I guess the French are finally fed up with being taxed to death. From Fox News: Thousands of French protesters flooded the nation’s capital Saturday to demonstrate against President Emmanuel Macron’s controversial fuel tax increase — clashing with policies as they called for Macron’s resignation. 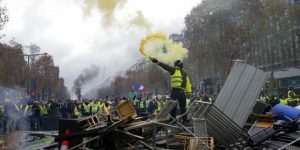 The angry clashes, both in Paris and other towns and cities across the country, mark the eighth day of “yellow jacket” protests against the tax, but have also come to encompass a growing anger against Macron and the French ruling class — seen by many as out of touch. The yellow jackets have become a uniform of sorts for the protesters, originating from the neon yellow jackets French drivers are required to keep in their vehicles. Authorities said that at least 8,000 protesters flooded the Champs-Elysees in Paris alone, with 81,000 protesters in total nationwide compared to 244,000 last Saturday. Police deployed some 3,000 security forces after an attempt to march on the Elysee Palace last week. Police used smoke, tear gas and even a water cannon to try and disperse the protesters, Le Monde reported. Officials said that a no-go zone, set up around key areas including the presidential palace and the National Assembly on the Left Bank of the Seine River, has not been breached. At least eight people, including two police officers, were injured, while dozens of protesters were detained, including for throwing projectiles. In La Madeleine, an area filled with luxury brand shops popular with tourists, businesses shut down due to the protests. In other cities, such as Lyon and Marseille, protests were more peaceful. The diesel fuel tax has gone up seven euro cents (nearly eight U.S. cents) and will keep climbing in coming years, according to Transport Minister Elisabeth Borne. The tax on gasoline is set to increase by four euro cents. Gasoline currently costs about 1.64 euros a liter in Paris ($7.06 a gallon), slightly more than diesel. Macron, however, has said that gas tax increases are necessary to reduce France’s dependence on fossil fuels and fund renewable energy investments. The protests are the latest blow for Macron, who has been dogged by sinking internal poll ratings for months, dropping into the 20s as he has struggled to shed the perception that he is an out-of-touch elitist. This entry was posted in Liberals/Democrats/Left, Taxes and tagged Champs-Elysees, Emmanuel Macron, France, French ruling class, fuel tax increase, gas tax, La Madeleine, Marseille, Paris, yellow jacket protests. Bookmark the permalink. And Macroni wants a European army that can defend itself against the US(his words). He is the perfect caricature of the Snotty Frenchman. Golly, how could any puppet –I mean, protégé!– of the Rothschilds be one of the elite? They can’t be, because they’re working for them, so the term ‘wage slave’ is more appropriate.